Save for later! Pin this guide to your Pinterest travel board. My nephew once asked me if he could come stay with me in New York City because he’d heard it was the city that never sleeps. Although he was undoubtedly fixated on this expression’s more literal connotations, I understood what he meant because I, too, have been fascinated and downright smitten with NYC ever since I was a young girl. It’s easy to be captivated and even overwhelmed by the City’s the endless opportunities to explore, sightsee, get lost, and be entertained. It makes total sense that first-time NYC visitors trying to plan out itineraries only a couple of days long are daunted by the task. 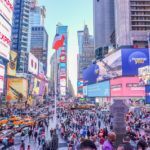 Truthfully, most NYC visitors only scratch the surface by visiting popular spots like Times Square, the Empire State Building, and Central Park. 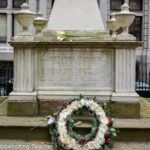 I’d like to highlight a Lower Manhattan 2-day itinerary that includes some well-known spots, as well as some quieter spots, you may not realize are right under your nose. 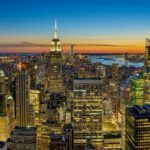 This is not a hurry-up-and-cram-everything-in itinerary, but rather a get-to-know-Lower-Manhattan itinerary. Let’s head south, shall we? The Brooklyn Bridge is my all-time favorite NYC landmark. 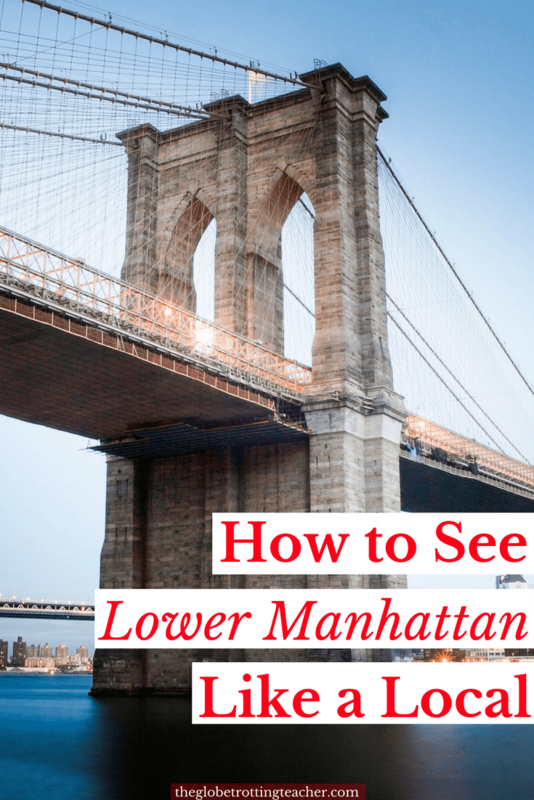 No visit to Lower Manhattan, or to NYC for that matter, is complete without walking across the Brooklyn Bridge’s elevated pedestrian promenade to admire the East River, the city skyline, and, of course, the bridge itself. 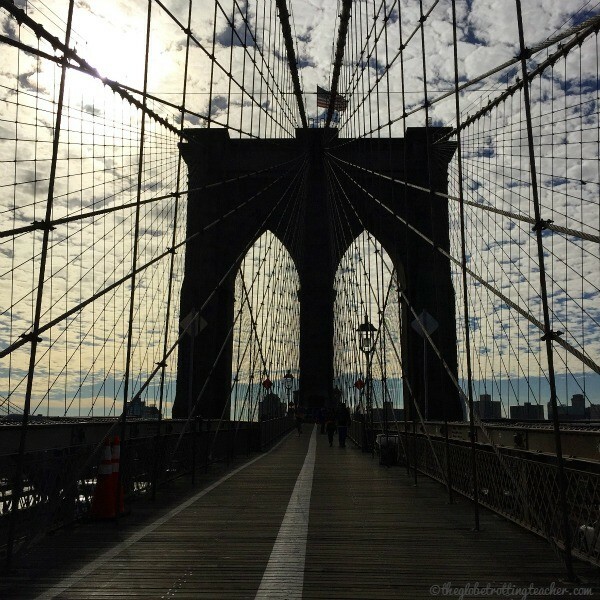 The history of how the Brooklyn Bridge was built is an incredible story and I could elaborate at length on the bridge’s engineering and the dramatic plot twists that took place during its construction. But for the sake of keeping with the theme of the post (we only have 2 days after all! ), just ponder over the epic task it was to undertake such a project before electricity and power tools and try to wrap your head around the Brooklyn Bridge being totally built by hand! The stone towers with their pointed Gothic arches and the geometric designs of the cables make for great photo opportunities, especially in the morning light. You can see the Freedom Tower from the Brooklyn Bridge. 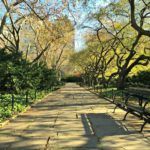 After your stroll across the bridge, walk through City Hall Park, cross Broadway, and head down Vesey Street to the 9/11 Memorial and Museum. You will notice historic Trinity Church, which served as a place of refuge for workers and volunteers taking part in the 9/11 recovery efforts. There is a lot of construction happening around the World Trade Center, but the Freedom Tower, the reflecting pools, and the museum are complete. 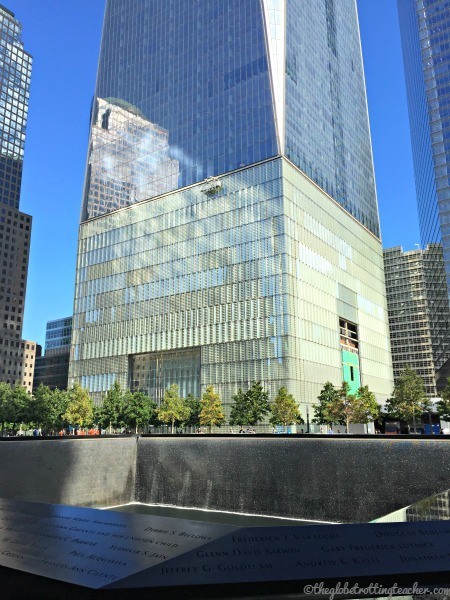 Head toward the World Trade Center for a visit to the 9/11 Memorial and Museum, opened to the public since the spring of 2014 and still a new sight for many New Yorkers. The North and South Reflecting Pools are the original footprints of the Twin Towers. Names of the victims are inscribed into the surrounding ledges. The museum entrance is located between the 2 reflecting pools and is another must-do while visiting Lower Manhattan. 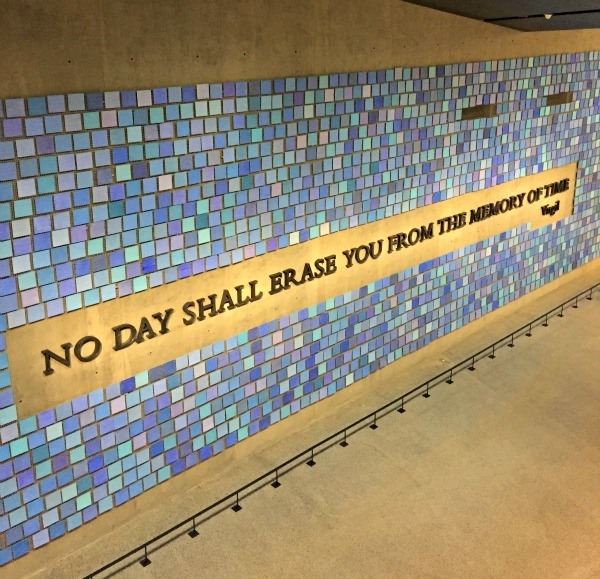 The museum is incredibly well-done, serving both as a tribute to those lives lost and as an educational center about the events of that day. There are places for silent reflection and to remember the people who perished. The museum also has countless artifacts teaching about the events of that infamous day. 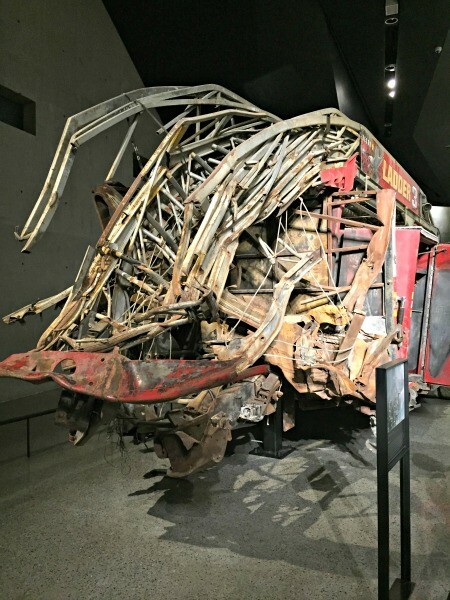 Here is one of the mangled fire trucks from the World Trade Center site. The museum is highly emotional and does have early exits if you wish to leave specific rooms or areas. You can avoid waiting in line by purchasing a timed-entry ticket online before your visit. 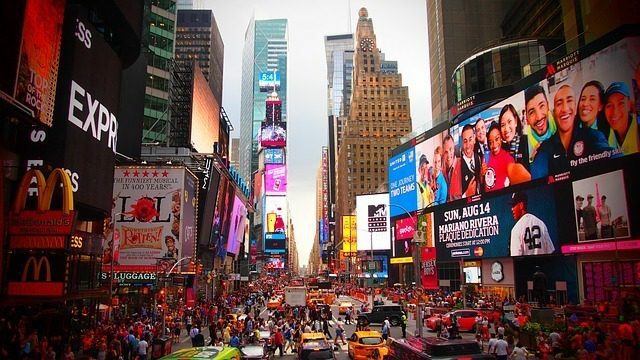 Even better is to get a discount at up to 6 NYC sights with a CityPass. The museum suggests the subject-matter may not be suitable for children under 10 years old. Depending on your pace, the museum visit could take upwards of 3 hours. After spending nearly 2 months(!) on jury duty, I can assure you Excellent Dumpling House at Lafayette and Canal Streets is the BEST Chinese food in Chinatown. 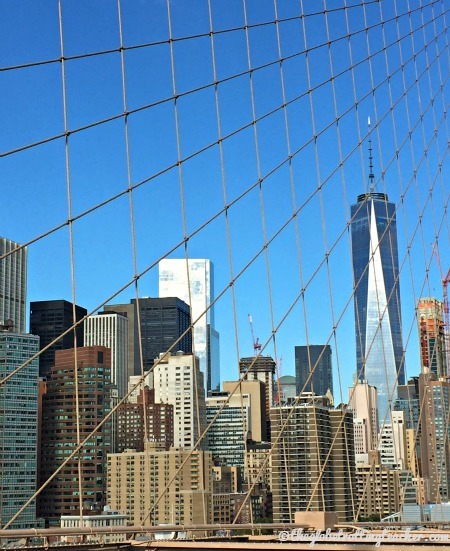 You’ll undoubtedly be hungry after walking across the Brooklyn Bridge and visiting the 9/11 Museum, so head back towards Broadway and City Hall Park to catch either the “R” or “6” Train uptown to Canal Street, a.k.a Chinatown. Do not think twice. 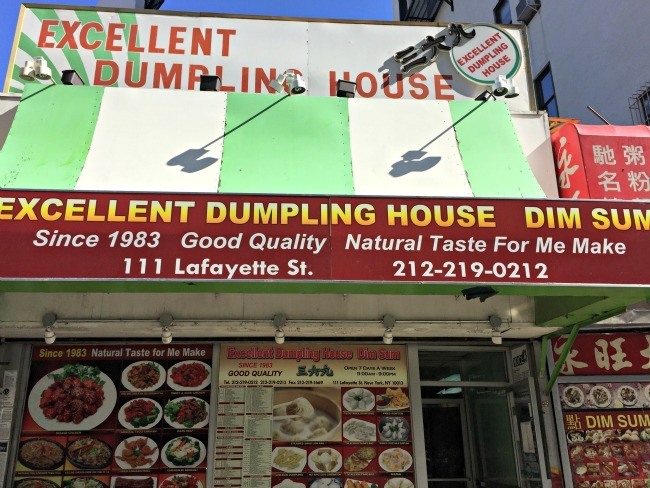 Head directly to Excellent Dumpling House at Canal and Lafayette Streets and order as much food as you can possibly eat. Yes. It’s that good! Whether you want chicken with vegetables or you try some of their delicious noodle soup (sorry no photo…I ate it all! 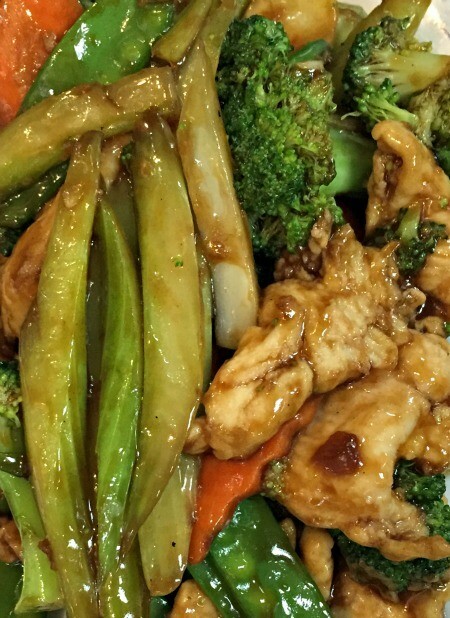 ), you will be glad you didn’t wander Chinatown trying to figure out where to eat. When you’re blissfully stuffed, wander through Chinatown, do some shopping, find some delicious (and hard to find!) Asian fruits, and take in the ambiance of the chaotic foot and vehicle traffic. TIP: Want an NYC Do and Don’t? Skip Little Italy. Opt instead for some authentic Italian bites on Day 2. Keep reading! If you can, meander off-the-beaten-path down Mott St. to find the iconic streets, Pell and Doyers. Film and TV crews used these quiet streets for numerous scenes in TV shows and movies. Nom Wah Tea Parlor is still open after nearly 90 years and Tings Gift Shop sells trinkets you can only find in Chinatown. Don’t be fooled by the calm, though. 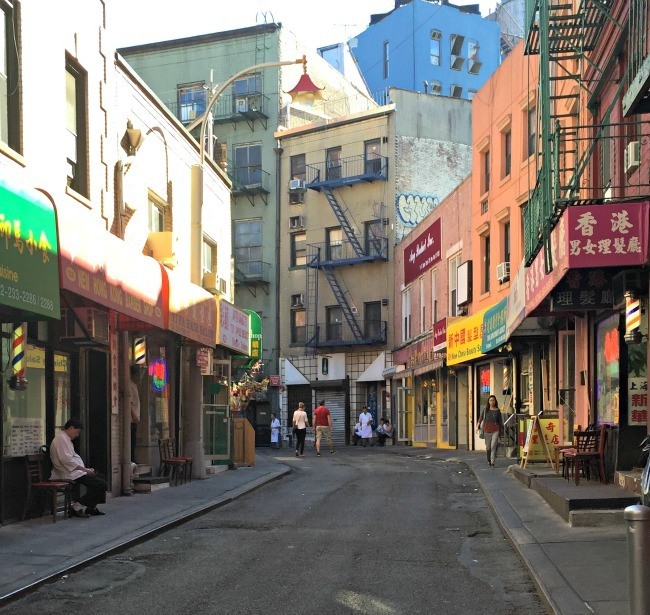 Doyers Street used to be infamous in the 1930s for its Chinese gang murders and its secret alleys to help gang members escape. No exploration of Lower Manhattan is complete without a visit to Greenwich Village. Take the “1” Train south to Christopher Street. Stroll down Grove Street and to Bedford Street. You’ll notice these narrow streets are quieter and lined with houses. Among these streets, there are countless not-to-miss places! Here are a few. 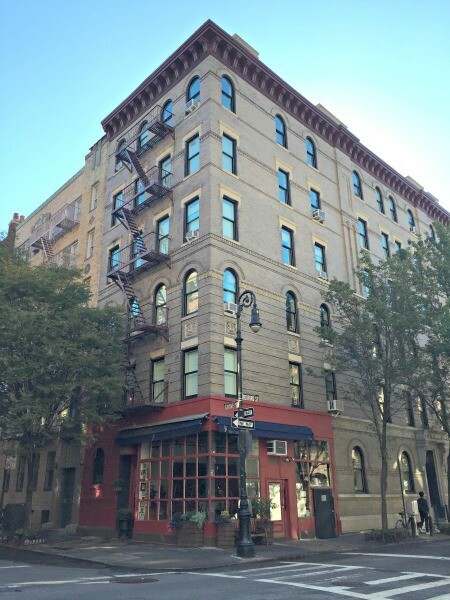 At the corner of Grove and Bedford Streets, you’ll find the building used for exterior shots of the Friends apartment building. 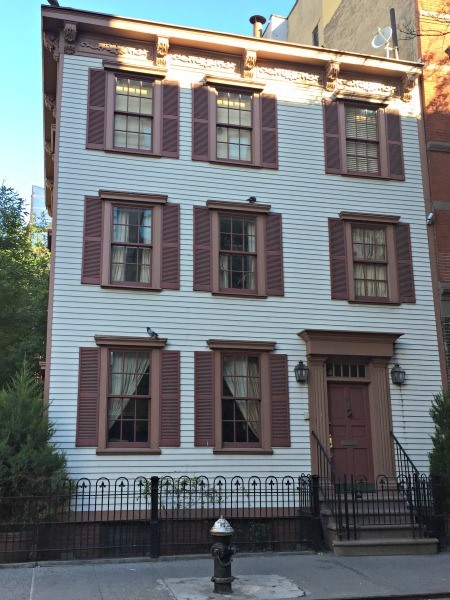 Before heading down Bedford Street, take a look at one of the oldest houses in NYC, made with a wooden frame, which today is not permitted by modern day building codes. 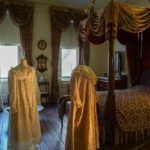 Then, walk further on Grove Street and find a collection of Federalist style row houses and the secretive Grove’s Court. 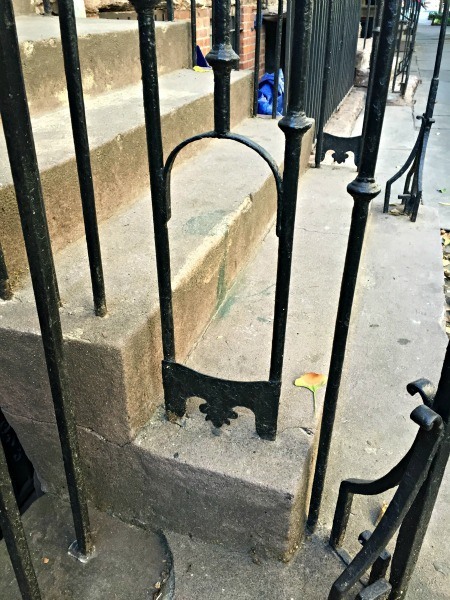 Some of the Federalist style row houses still have the original wrought-iron railings. These round-arched openings came in handy as boot scrapes back when the roads were full of mud! Head back to Bedford Street and turn right to find 75.5 Bedford Street, a.k.a the narrowest house in NYC, at just 9 feet wide! It was once the home to several celebrities, including Cary Grant. The next stop is Bleecker Street, so I hope you’re feeling hungry! Bleecker Street is its own Little Italy and actually much better if you ask me! You could do your own food tour on Bleecker Street alone. 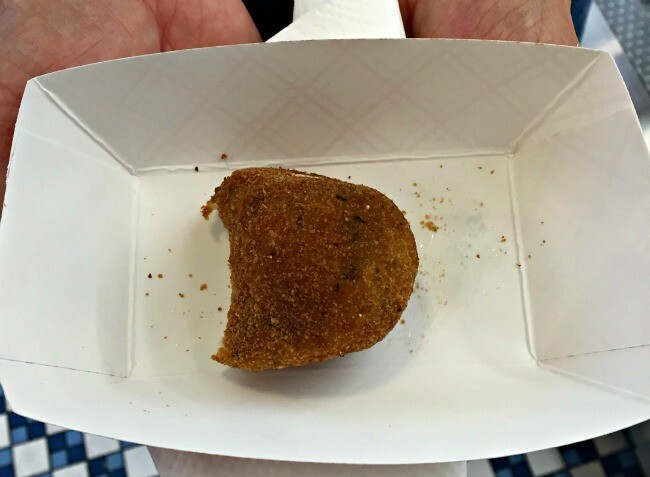 Taste the rice balls at Faiccos’s Italian Specialties. Oops..I took a bite before I got a photo! But, it smelled so good! 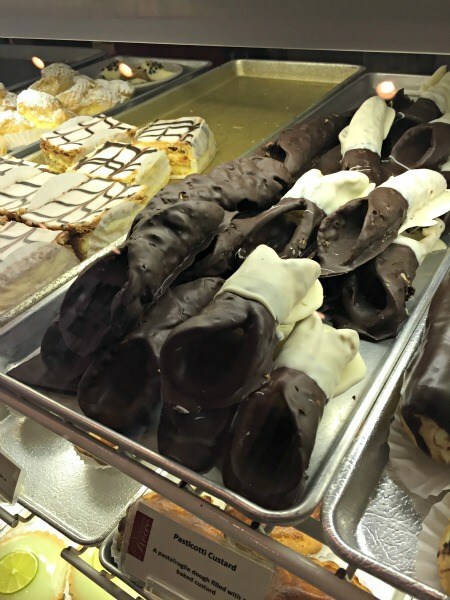 Sit and taste the cannolis and other sweets at Pasticceria Rocco. Save room for a slice of pizza or 2. Visit Bleecker Street Pizza for a margarita slice Food Network named “best pizza.” Then, pass the old Italian church on the corner of Bleecker Street and cross over 6th Avenue on your way to Macdougal Street. 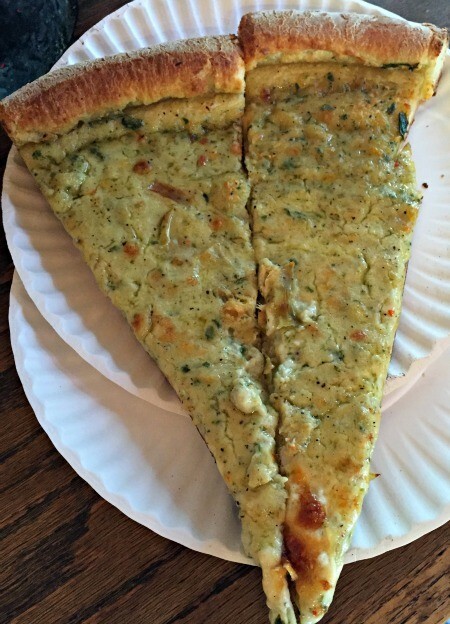 At 111 Macdougal Street taste an artichoke slice at the aptly named Artichoke Pizza. You simply cannot leave Greenwich Village without tasting it! The artichokes are chopped up super finely or pureed and mixed with a creamy, cheesy concoction of pizza heaven. The crust is doubled for extra crunchiness. I’ve been dreaming of this artichoke slice. At this point, you’ll be good and stuffed so walking off some calories is certainly in order. Walk north to the southernmost entrance to the High Line, at Gansevoort and Washington Streets. 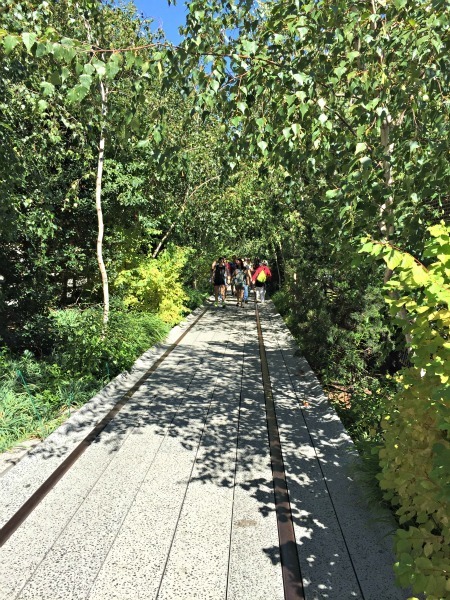 The High Line is an elevated, urban park built on old freight railway tracks. It runs from this southernmost point up to 34th street on Manhattan’s far west side. There are plantings and gardens along the old rail tracks, as well as art installations, exhibitions, events, and food and drink carts along the way. Anytime is great for strolling in NYC’s parks but in the fall, the foliage colors are vibrant and spectacular. Public art displays are part of the park’s appeal. Take in the views. Stop to sit and soak up the atmosphere of the park with the busy city streets just below you. If you walk the High Line to the end, you’ll be back in midtown at 34th street. Glimpsing the iconic NYC skyline from above would be a great way to finish the day. Time it right to see the views from the Top of the Rock. The views are best at dusk when the city’s lights are just beginning to sparkle. Is this an exhaustive list of all the things to see and do in Lower Manhattan? Of course not! That would be nearly impossible in the city that never sleeps. Hopefully, though, you end your visit to New York City feeling content at having explored Lower Manhattan like a local. 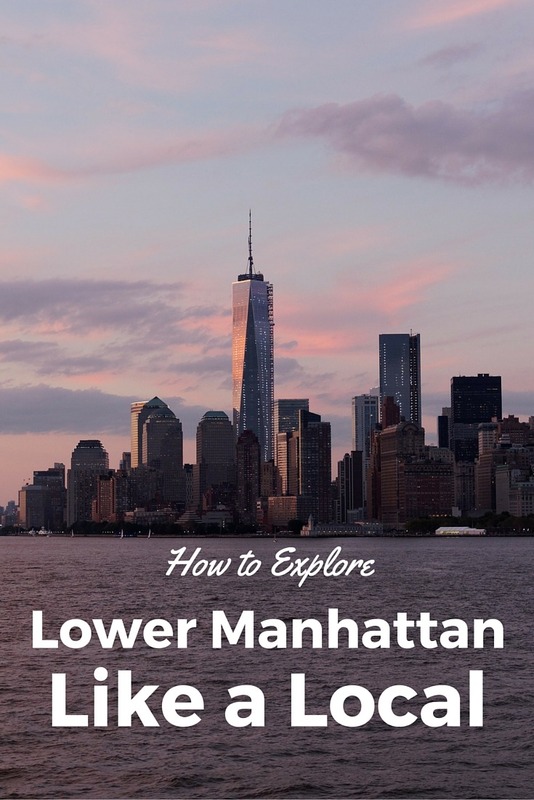 Have you been to Lower Manhattan? How have you felt like a local in a new city? I still haven’t been to NYC, but it’s been on my bucket-list for a really long time. I prefer to avoid the tourist crowds as well and discover a place like a local. It’s much trickier, but so worth it! I’ve just booked marked your post for when I do come to NYC. Please, never get bored of blogging! I love following your adventures. Such kind words, Mia! Thank you! I’m loving the time I put into the blog, so I hope you’ll continue to follow along. 😉 It’s so great when you can explore a new place without doing what every other tourist does. Hope you find some of these places enjoyable when you make it to NYC. It’s best to explore a new place like how a local does, it gives you a better feel of the place. Thanks for pointing out cool spots to visit. the ideas. 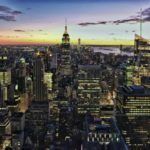 Manhattan sure does have a lot to offer and I am really thrilled to see some of these places here in your blog. It’s so true, Karla. Finding local spots helps you get such a better sense of a place and in Manhattan there are so many places to explore! I’ve been to New York for 10 days and still felt like I only scratched the surface! What a great city it is! 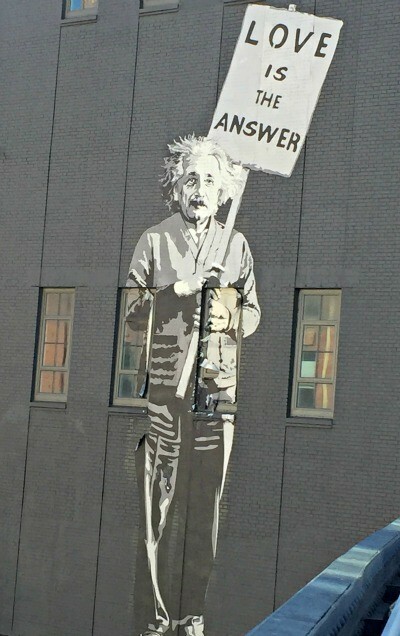 Would love to come back to walk the High line! NYC has so much to offer, Els! The High Line is great in the spring and fall and there are events and activities listed on their website, Friends of the Highline. Hope you are able to make it back. Thanks, Simone! NYC is such a special place! Great guide Jackie! I visited NYC only once with my family when I was a kid and to be honest it was all a blur. I can’t wait to go back one day and give this awesome city the attention it deserves. I’ll definitely be referring to this post before I head back. 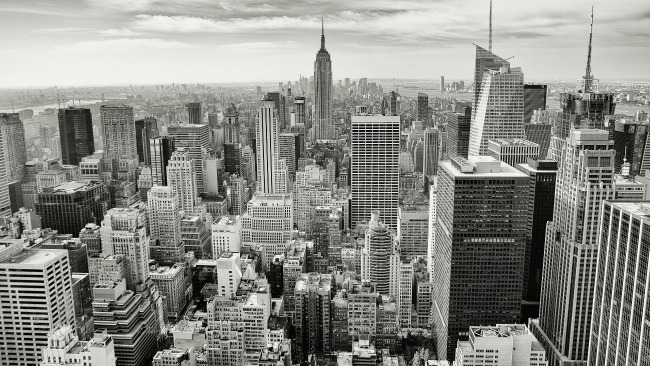 Terrific post – it’s made me want to go to back to New York so much! I haven’t been for years and there’s lots that’s new and I need to see…. Thank you, Sarah! So glad it inspired you to return. There’s always something new happening in the Big Apple! Love, love, love! Great tips. Love the fact that these are all locally recommended. Makes all the difference! Thank you, Anna! You are so right! Local tips and advice are always great. Great guide with plenty of detail and photos. Thank you, Beverly. Glad it’s useful. I love Lower Manhattan! when I lived on the Upper West Side years ago I never wandered down there. It did seem all grimy and urban. Now, it’s one of our favourite parts of Manhattan when I bring the kids back to visit. 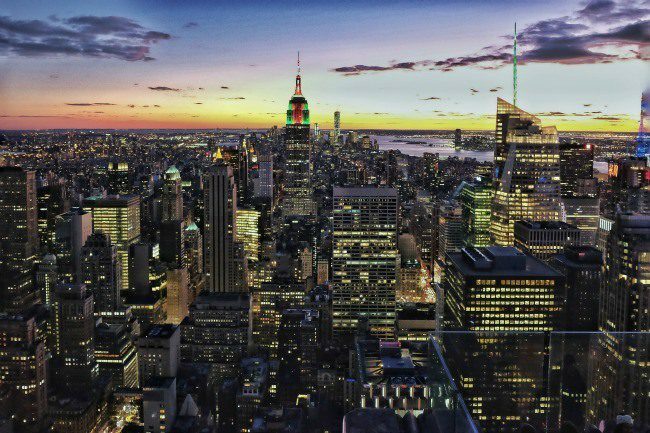 Now that we live on the west coast, we don’t visit NY as much but this is a great guide for our trip in 2016. Fantastic, Lesley! Happy to answer any questions you have or offer any tips to make your trip great! When I lived in DC, I’d go up to NYC one weekend a month and stay in Lower Manhattan. I learned a lot about it then, and I found it to be really cool. It has a spark of its own. That’s great you were able to make it up to NYC so often, Laura. You are so right. Lower Manhattan does have a spark of its own. It’s chic, but with a relaxed and free feeling. 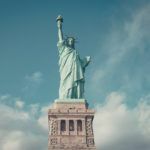 We are going to NYC in a few weeks for the first time, so this is such a great post for me to add to our ever growing list of things to see and do. Thank you for linking this post up with #TheWeeklyPostcard . This is high on my bucket list so I’ll be sure to use as a reference. Times Square, Central Park, Empire State Building and so much more on my list, but to explore as a local is premium. Hopefully in 2017 we get to US and Canada. Thanks for the invite, Lyn, and for stopping by to read and comment! I’m with you. Local tips and advice can’t be beat. Hope you can make it for a visit in 2017! Such an amazing roundup guide! NY just has so many things to offer! Thanks, Erica! Yes, NYC is such an exciting place to visit. That’s a very informative post. Thanks for sharing. 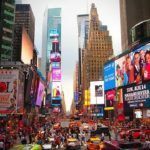 New York is on the top of my list so this 2 day itinerary is ideal for a trip there. Thank you. Glad it will be useful for your NYC trip! New York! I would love to go some day. I’ve only been to Las Vegas and Hawaii, I have so much more to see in the US. New York is definitely on top of my list next time I visit. I love your tips! The best way to see a city is always in the eyes of a local . Thanks, Gia! Local tips are always the way to go. I haven’t been to Hawaii yet, but I’d love to go! Hope you make it to NYC soon. Never been to NY yet and i think i’ll print your post for a dream travel!! The Friends building is absolutely a bucket list!! Ha! Yes, Mags, I guess there weren’t too many dancers gobbling up slices of artichoke pizza and rice balls! NYC is such fun! Hope you can make it back soon! first time I visited NYC I was there for 5,5 days. Needless to say with good planning (it’s the one itinerary I’m SO proud about) I not only did the tourist stuff, but explored Greenwich Village/SoHo and Chinatown! I didn’t walk on Brooklyn Bridge, but eventually managed to on my second visit to the city! I’ll agree about Little Italy…I was not impressed. The best Italian restaurant I’ve visited in NYC (twice) is il Buco in NoHo. Awesome, Anna! It sounds like you had great trips to NYC and really got a feel for it! I’ll have to give il Buco a try! Next time, try out either Morandi or Lupa (both in the Greenwich Village area) for excellent Italian food! Great list – I tried as many slices as I could in the city and Bleeker was still the best around. I’ll be back to NY for a quick visit in a few weeks, actually, and that’s one of the things I’m very much looking forward to! We are heading to NYC in November and this is absolutely PERFECT!!!! I love itineraries like this that are so detailed and do the planning for me! Thanks so much Jackie! I’m visiting NYC in a few weeks and will stay in lower Manhattan this time. I bullet-pointed all the places you recommended and can’t wait to follow your itinerary!